You can select items to be displayed in the Test Report view. Test Report has many items, but there might be any item you do not use. In such case, let’s customize Test Report easy to see by displaying only necessary items. First of all, you select [Tools] -> [Setting] and display the Setting dialog. You click “Customize Test Report View” in the setting dialog. You select the items to be displayed in the Test Report View in this dialog. 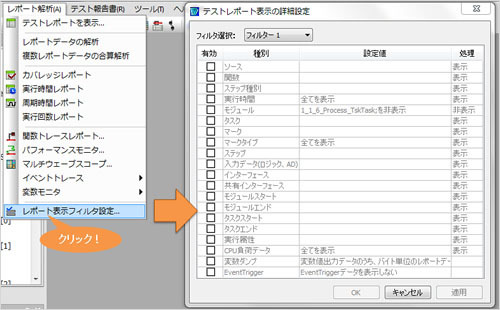 The next time, the only items checked in detail list of this dialog will be shown. 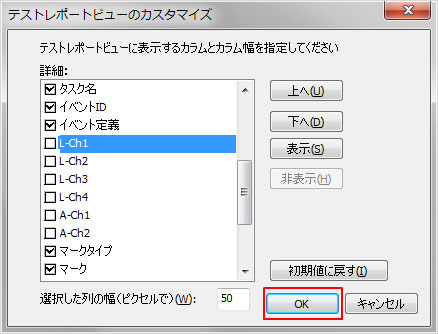 For example, if you do not use AnalogBox, please check off “L-Ch1~4, A-Ch1~2″. At this point, you can change the order of items by using “Up /Down” button. When you finished selecting items to be displayed, click “OK” button. You will see the only items, which are checked in the list, in Test Report. So let’s use the filter setting and display only the executed path in Test Report. The filter setting allows you to easily follow the program’s executed path. First of all, you select [Report Analysis] -> [Set the View filter of Test Report...] and display the View filter of Test Report Setting dialog. Please set the following conditions in the View filter of Test Report Setting dialog. When you click “OK” button, unnecessary report line other than the processing will be minimal. 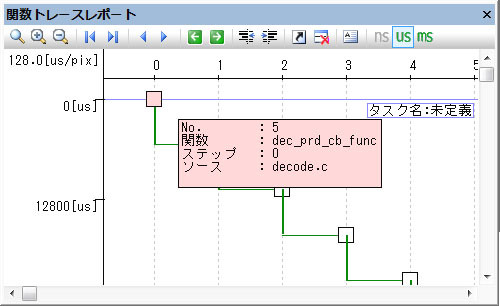 You can check and forward the execution path of the process by entering “F10″ key in Test Report. You can narrow the range of Report Data in various conditions by using filtering function. It is difficult to check and follow every detail process since the Report Data collected by DT10 is enormous amount of volume. So when you perform the analysis of data by using DT10, you can display necessary data to be checked. By filtering the data to shown in Test Report, you can expect to reduce your workload to analyze bugs. In order to set the filtering, you turn ON the check box of “Enable” for the type to become a filtering condition and enter the value in the “Setting Value” field. Also you can select whether show or hide the setting conditions by choosing “Show/Hide” in the “Process” field. Function You can configure filtering settings by source file name or function name. e.g. You would like to display a designated source file or function only in Test Report. You would like to not display a designated source file or function in Test Report. 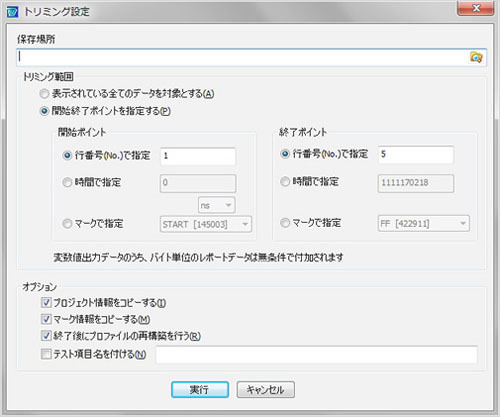 Step type You can configure filtering setting by the Step type. e.g. You follow the process by function basis by only showing FuncIn/Out. You do not show the Free Test Point manually inserted for test. -> You can set filtering depending on the type of Test Point. Execution Time You can configure filtering settings by specifying the range of Execution Time. e.g. 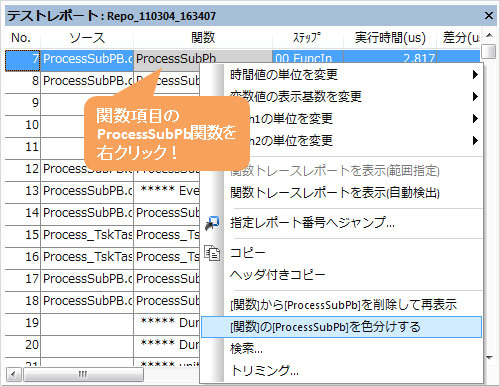 You would like to confirm processing flow of 1ms before and after of a certain process. Task You can configure filtering settings by module name or task name. e.g. You would like to display a designated module or task only in Test Report. You would like to not display a designated module or task in Test Report. Mark type You can configure filtering settings by pre-assigned mark or its associated mark type. Step You can configure filtering settings by specifying any step. e.g. 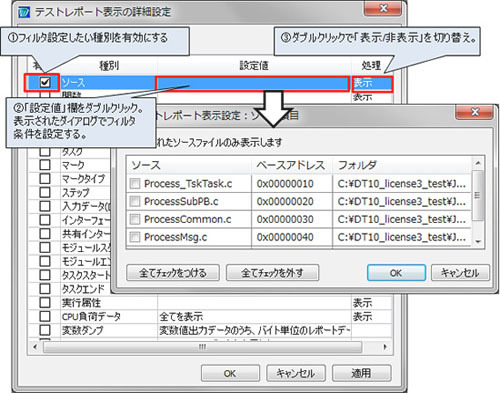 It is helpful when the step you wan to see can not find in Test Report. (Logic, AD) You can configure filtering settings by AnalogBox data. e.g. You would like to check the process which the voltage of A-ch 1 is equal to or greater than 3V. You would like to check the process which L-ch1~4 are in all Hi state. Task end You can configure filtering settings by pre-assigned interface attribute. Execution attribute You can configure filtering settings by pre-assigned execution attribute (normal / unused / Pass through prohibited / Non-passing). e.g. You would like to confirm whether the steps with execution attribute of unused / pass through prohibited / No-passing would be passed or not. CPU load data You can configure filtering settings by specifying the range of CPU load data. e.g. You would like to display CPU load data only when CPU load rate is more than 80%. 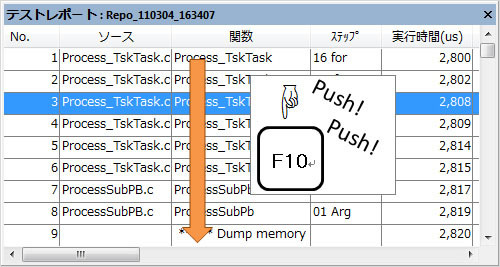 Variable dump You can configure to hide the ”***** Dump memory *****” message from Test Report. 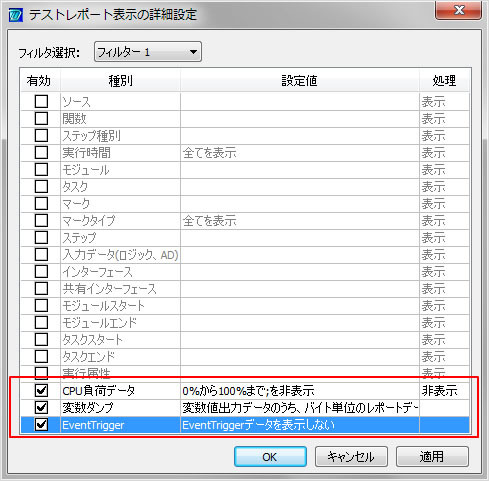 EventTrigger You can configure to hide EventTriger data from Test Report. As we explained in the “Narrowing the range of Report Data (Filtering)” section, it becomes highly efficient to analyze bugs by narrowing the range of necessary Report Data. You can also narrow the range of Report Data by using trimming function. In order to perform trimming, you right-click on the Test Report and select [trimming] in the popup menu. When you select [trimming], the trimming dialog appears. You configure the save location, trimming range, option settings in the trimming dialog. Please specify the location to be saved for trimmed Report Data. When you click the folder button, a folder selection screen appears. Please specify the range to perform trimming. There are some ways to specify the range. -> The range for this trimming is targeting all data being currently displayed. This is ideal for trimming to the Report with filtered. -> You can specify the trimming range for Report Data. 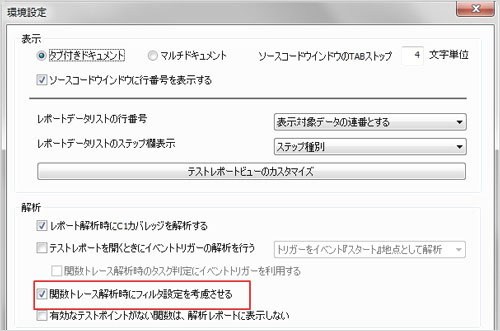 ※Before opening the “Trimming Settings” dialog, you choose all the range to be trimmed in the Test Report, it will automatically set the above line number or time as a value to be used for trimming. You can configure settings for the trimmed Report. -> The above 3 points should be checked when you confirm the trimmed Report Data in the same project. ※Please enter the test item name if necessary. After settings are finished, please click “Execute” button. When you open the Test Report created in the “Save location”, the Test Report, which trimmed with the specified range, appears. You can highlight the selected items, strings and values as colored section on Test report View. When you would like to check Test Report with attention to certain source file or function, you also need to check processes behind it. If you use filtering settings, it will lead to see only data to be matched. In such cases, this color-coded feature of report would be useful. You choose the strings or numbers to give attention and right click to display the pop up menu. You select “Color coded [strings or value] from [item name]” in the pop up menu. When you select “Color coded [strings or value] from [item name]“, the color of Reeport Data will change. This allows you to focus on the data mainly with grasping overall processing flow. You can also color-code multiple items, it allows you to check the Report Data focusing the conditions. You can left any mark (comment) in Test Report of DT10. By this mark in the Test Report, it will lead to migrate to analysis work smoothly. The marking feature allows you to enter the comments at any timing during getting Test Report. Therefore, it makes clear for you to identify the range you should focus at the analysis by linking the key stroke of target device with the comment. For example, in case that you would like to get Test Report from “Power On” to “Power Off” of the target, you should start getting Test Report in the state of the target’s “Power Off”. When you start getting Test Report, “Getting Test Report” dialog appears. You should enter your mark in the “Book Mark” field on this dialog. At the same time of the target’s “Power On” operation, enter “START” in the comment field and click “Set” button. So you will find the mark you set on the bottom. 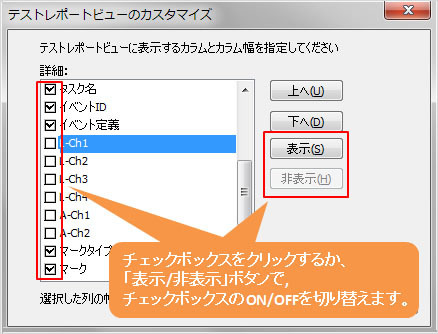 Also at the same time of the target’s “Power Off” operation, input the comment as “END”. You set the mark in this way, your comment will be registered into the log nearby “Power On, Power Off”. When you stop getting Test Report. you can find your marked strings in the “Mark”, “Mark type” field. You also find a list of marks called as “Mark View”. You can find the Report No. that you set the mark by checking the Mark View. Also you double click on the Mark View, you can jump to the designated Report No. of Test Report. 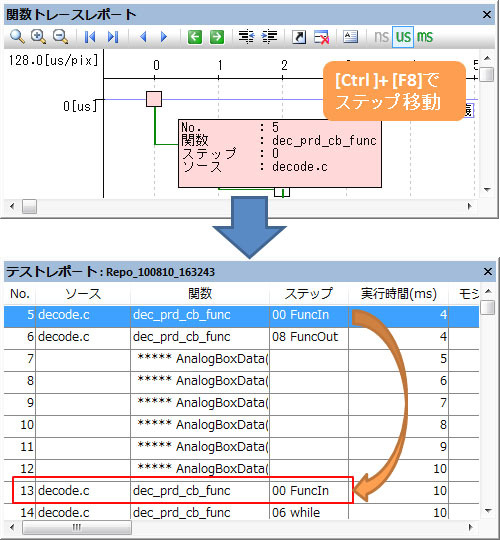 The example in the above figure, the marked “START”~”END” is corresponding to the Report No. 400000~450000. 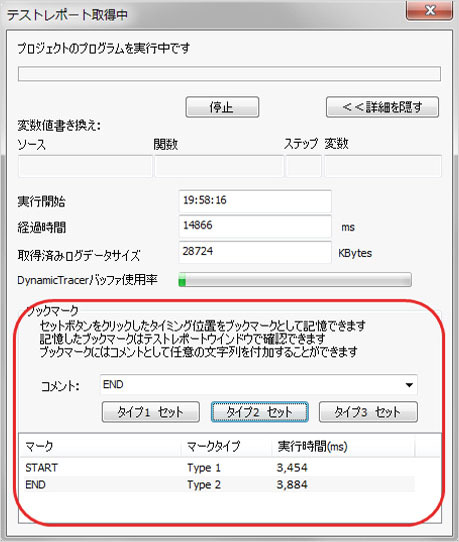 You can narrow the range by trimming Test Report or specifying the range for Function Trace Report, Event Trace Report within the Report No.400000~450000. Additionally, you can edit / add the mark to the Test Report which already obtained. You set the mark to the Test Report which you once finished the analysis, it will lead to the smooth re-analysis when you need it. You can forward in sequence only the step which you would like to see in Test Report. 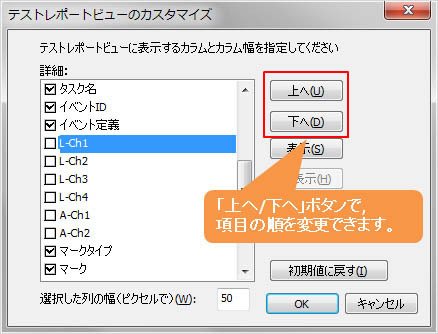 This method is useful for the case that you do not need filtering, but there are steps not to be checked. First of all, you configure the filtering with the condition of steps to be shown in Report Data. 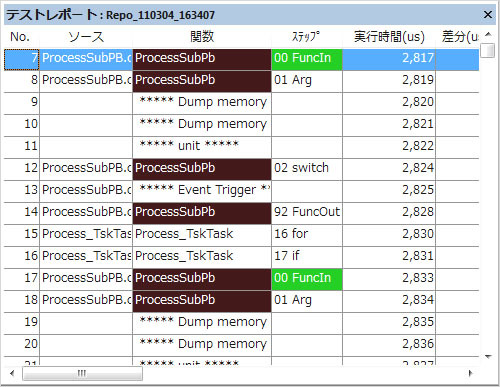 When you display Function Trace Report, the Function Trace Report which display only the steps setting filter. 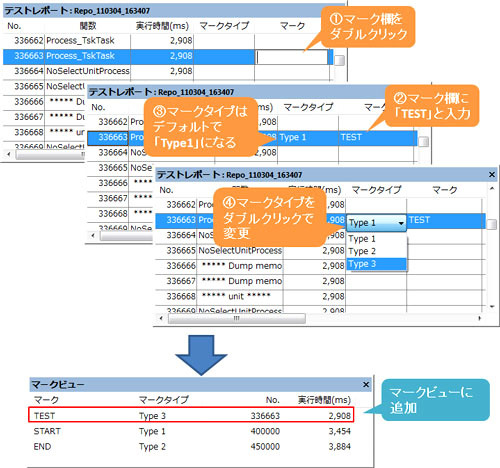 After finishing Function Trace Analysis, reset the filter of Test Report. 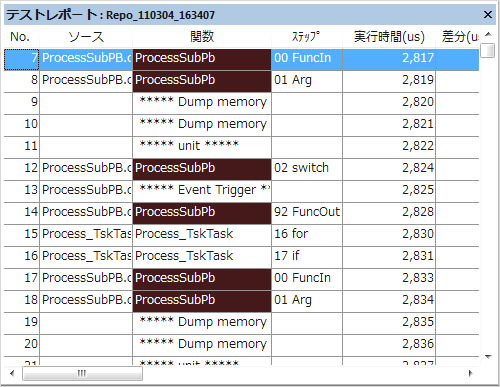 When you perform the step movement (Ctl+F8F7…) from Function Trace in that state, you can forward only step you would like to see while you overview in the Test Report.